Development of this project is funded by the Mozilla Foundation through their Ignite Challenge. This project deals with the detection, observation, and assessment of situations requiring intervention by emergency responders, offering them access to high-quality "live" data that may be visualized effectively both by responders in-situ and by remote operators in dedicated control rooms. Its components will include multimodal data registration, interactive visualization capabilities, and live streaming of the integrated contents. Click here to try out the prototype. The rtER client app is available as an apk download for Android (low-frame rate for testing). The iOS version is awaiting updates. Note that the prototype runs on a development machine, which may go down at various times for reboot, etc. The scenario below, loosely based on actual events during and after Hurricane Sandy, illustrates how our rtER app would be used. We envision the rtER smartphone application installed on the phones of people in the National Guard, military reservists, etc., who have some background in emergency response, and who know how to keep themselves safe in a disaster area. Further video would be streamed from the public via other applications, but would lack the guidance system shown in our demonstration video. Assuming a pre-existing communications network (or an alternative channel) can be kept operating, our rtER technology will help improve detection and response time in such critical events requiring urgent attention. The worst of Hurricane Sandy has already passed through New York City the evening before, leaving widespread damage. The VOST network has been monitoring the damage all night, feeding information to the Public Information Officer (PIO) at an emergency response centre. With the first responders stretched thin dealing with immediate crises, the VOST are key in planning and coordinating the first relief efforts and keeping the public informed and up to date. Communications were poor and disorganized: "Across a flooded parking lot, Jack O'Meara and his wife, Aileen, were waving flashlights to alert the firefighters." Local firefighters were unable to respond effectively to the fire: "The community's third company of volunteers, 10 men from the Volunteer Fire Department of Roxbury at the other end of the point, also saw the glow from the fire, but they, too, were in no position to respond. They were on the second floor of their firehouse, driven upstairs by the flood. Their fire trucks sat in four feet of water. All the radios were down, the phones dead. Only when the water went down a couple of feet could they drive to the fire." Even with functional communications, prioritizing and directing rescue efforts would have still been challenging. Trained responders were in a position where they could not communicate their status, or know how best to participate in the emergency. People were in danger over a flooded and burning area the size of two football fields, surrounded by an emergency extending miles around the area. Video feeds from the area, visualized geographically on an interative map and linked to a grid where they can be organized based on priority. Violet sees a tweet: "Fire in houses across the street in #BreezyPoint, strong winds spreading flames!". Using the map view to correlate the tweet with live video feeds she finds a firefighter from the Roxbury Volunteer Fire Department, who is also tweeting and streaming video from his phone using the rtER mobile app, showing a large glow in the direction of Breezy Point. Violet moves the priority of that video to the top by dragging it, and messages Victor, telling him that emergency responders and displaced citizens are going to need a safe place to stage and regroup in the area of the fire. The position of the video is already updated on his screen. Homing in on the map, Victor finds another streaming video, being sent by Anne, who is closer to the fire. Anne is focusing on the fire itself, but Victor needs to find a safe area that is not flooded, and is not burning. He selects this video feed, and prompts Anne to pan to the right, looking for a safe spot. Anne sees an indicator telling her to move right. She does so, and Victor sees an empty parking lot across a wide road from the fire. Victor messages the Public Information Officer (PIO) responsible for Queens, who is situated in a remote Emergency Operations Center, with a message, "Fire in Breezy Point <link to first video feed> - safe area here: <link>". The PIO, who is viewing the unfolding situation in a large-scale immersive display environment, allowing her to keep tabs on additional trouble areas at various locations, and view live video streams from each of these, can now direct people toward the parking lot, and make sure there are responders there to meet them. After getting confirmation from the PIO that responders will be using the parking lot to stage relief operations and help displaced citizens, Victor annotates the video feed with this information. Finally he places a static marker on the map with this information and promotes it to the top. Meanwhile, Violet, still monitoring social media sees a tweet: "Scrapes, bruises and cold in #BreezyPoint. Why is no one helping us?". Noticing that the tweet is near the new staging area that Victor just flagged, she responds to the tweet giving directions to nearby help. In January 2013, a 48-inch water main broke at the top of the hill that descends into downtown Montreal, right through the main McGill campus. There was massive flooding through all of the streets and into many of the buildings on the surrounding campus, with black ice underneath, making it practically impassable in many spots. The campus was almost completely surrounded by water making it challenging to find a way off campus. Jeff left just after the main break, but before any official news had been sent. He could not get off campus easily since the water was flowing too deep and fast through the streets, and had no way of figuring out how far the situation spread without slogging through knee-deep water. There were many students and others standing around with cameras taking pictures and video all around campus (later dozens of videos were posted online) and posting on social media. For those in the buildings trying to plan their way home, being able to see these images, videos and tweets might have been helpful. But without some way of sorting and filtering it might also simply have been overwhelming. We imagine that rtER would have helped us solve this problem. By allowing information---video, image or text---to be visualised in geographic context on the rtER map, users could have quickly understood what was occurring where. Moreover, filtering using the map would have provided a way for those looking for a way of campus to eliminate all superfluous information and see only the information coming from one area on their map. This would mean you could quickly confirm or deny if a route was safe. Since we are trying to build our system with collaboration in mind, repetitious search would be avoided and time could be saved. For example in this case most people posting pictures and videos were ``ambulance chasing'' by showing the drama and devastation, not the less interesting safe area. This means that the ``useful'' information was being buried by the ``shock value'' videos. Once a person had found a safe passage using our system, via a tweet suggesting a safe route or possibly a picture or a video showing an unflooded area, they could promote that information to higher priority for others to see. As a result the next person wouldn't need to repeat that search. They might instead simply add a confirmation after using the route, or perhaps provide an alternative. In this way we hope our system may make a more efficient use of human resources. The long-term objective involves distribution, registration, and interaction with static and live multimodal data sets collected from heterogenous sensors (statically positioned video cameras, multispectral imaging devices, smartphones deployed in the field, audio feeds, and even social community reports) to facilitate the task of emergency and disaster responders and their operations centers. In the first development round, our efforts revolved around a prototype visualization environment for the Emergency Operations Center (EOC), allowing coordinators and dispatch operators to obtain a rich, immersive, contextual view of the environment about which they were making decisions and allocating resources. To support real-time decision-making, the prototype integrates live video streams from smartphone cameras, tied to their location in the scene. This is demonstrated in our video of the prototype in action, combining the video streams and mash-up data of relevance to emergency management within an immersive, navigable, street-view representation of the environment. However, this would overwhelm the networks and the personnel who have to sort it all; having information flow from the public directly to the command centre is impractical. Thus, our visualization tool is only useful if the data can be pre-processed and filtered before it arrives at the EOC. Prompted in large part by our discussions with emergency network representatives and disaster management personnel, and in particular, with credit to Scott Reuter, we learned that "virtual volunteers", organized into Virtual Operations Support Teams (or VOSTs), are activated during crises to deal with exactly this problem. For example, the New York VOST was activated for Hurricane Sandy by the local Fire Rescue and Emergency Services. "During large-scale emergency events millions of new posts, pictures and videos are added to YouTube, Twitter, Facebook, etc. every day. How can a small local public health, first response, or emergency management agency sort through all of that?" "I'm way too busy to watch the internet. Prior to use of a VOST, we just simply wouldn't listen to the community. We would connect with emergency response organizations and limit our engagement with those who would just call 911. That is a very limited view of the world and opens us up to all sorts of media scrutiny for perceived failures in the community. And we've had enough of those 'respond to the media after the bad situation' moments." This led to our focus in the second round on team-based data management. 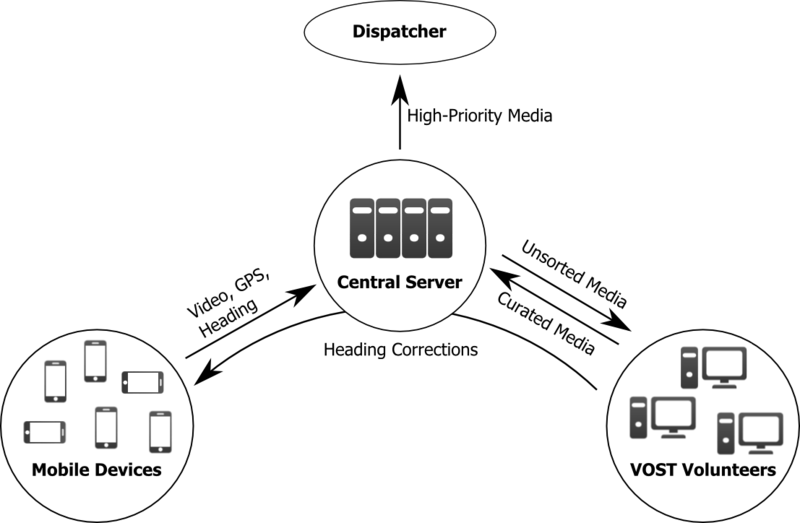 The tools we developed are intended to support the tasks of the VOST, working with multiple data sources, and possibly interacting with the individuals who are supplying them before this information reaches the EOC. Specifically, our prototype helps virtual volunteers effectively receive, understand and take action on live picture or video streams relevant to the current disaster, and supports integration of accompanying text data, e.g., from chat sessions and RSS feeds, all linked to a geospatial representation of the corresponding locations within a map. In addition, the interface allows for remote interaction with smartphone users in the field, guiding them to orient their cameras in a particular direction to obtain a particular view as desired by an analyst. In the future, much of this video content may be generated by the public. Just as people post to Twitter and Facebook from disaster areas today, tools like Instagram, Cinemagram and Snapchat are also seeing use in the same contexts, generating significant network load. By definition, the virtual nature of the VOST-type volunteers that receive and process this information means that they will often be far from the disaster area, perhaps even in remote countries. In this regard, an additional motivation for us in developing prototype technology intended for use by the VOST community is that this helps move our project toward the goal of tapping into crowdsourced resources during crises. Our development efforts were focused on three key components during the second development round: an Android app that records and uploads live video streams, a central server that stores these video streams and their metadata along with various other content types, and a web client that allows for the synchronized collaborative sorting and curation of the content stored on the server, along with several additional helpful features. In the third round, our efforts included video streaming, iOS port, and significant functionality additions in response to feedback from users in the emergency response community. The typical use case for the mobile app places someone with a smartphone on site in a disaster scenario, primely located to provide relevant contextual data to emergency responders, possibly filtered by virtual volunteers. By opening the rtER mobile app, the smartphone user can stream a video feed, deemed to be relevant, which will immediately appear as a live tile to VOST volunteers, connected to the rtER web client, where it can be sorted based on its situational importance. Should one of the volunteers deem the video to be of interest, its live tile can be dragged into a position of prominence on the web page's grid layout, indicating its relevance to other volunteers and emergency dispatchers. Conversely, if the video feed is deemed to be irrelevant, volunteers can drag it out of the way, in order to maintain a high signal-to-noise ratio on the primary page. Furthermore, all uploaded video streams also include GPS metadata (latitude, longitude, and compass heading), which are all displayed as markers on an interactive map side-pane to provide additional contextual information about each video stream to emergency responders. Should a volunteer zoom into the map to focus on a particular area of interest, all video live tiles that are not contained within the map's viewable area will be filtered out and made transparent. Thus, video feeds can be easily narrowed down by their precise locations. A situation may arise where the individual streaming video is well-located but is not providing an ideal view of the scene. For example, a virtual volunteer, or eventually, response personnel, viewing the video stream, may want to more accurately survey a specific point of the disaster area, or simply scout for safe areas nearby. In such cases, the user can click on the video's live tile to bring up a contextual menu that provides a compass heading indicator along with a field-of-view cone for the associated mobile user, overlayed on a map. This target heading indicator can be adjusted to point in the direction of interest to the responder, and accordingly this feedback will be sent back to the mobile device. The user will then be prompted by a dynamic onscreen arrow to turn to the target heading.